Pairing error - Unequal Alliance War. The Pairing in Alliances War is not right. In our Alliance, we are for the moment five HQ31, five HQ28, thirty HQ25 and seven HQ23. Why do we face Alliances that have twenty HQ32, twenty HQ30, five HQ20 and two HQ12? The pairing in the alliance war is not right. In our Alliance, we are at the moment five HQ31, five HQ28, thirty HQ25 and seven HQ23. 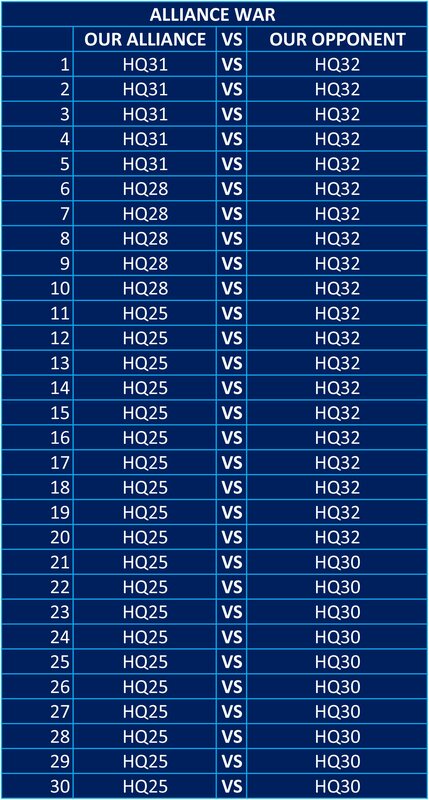 I ask: Why does the game in Alliance War, confronts us against Alliances that have, twenty bases of HQ32, twenty of HQ30, five of HQ20 and two of HQ12? Pairing in war is not only dependent on HQ level but also player level. Many therefore choose to not build some buildings to keep player level down while having HQ level as high as possible and therefore get easier war enemies. I can add that the strategy as outlined above was such a nuisance that we stopped having wars as we had no chance against alliances optimized for war. However, the HQ limitations imposed (85 for hq31 etc) have had a positive effect here I believe and wars are now rather enjoyable (unless you are already maxed like me and therefore have no use for the resources). Appreciate your eagerness in winning the battle, @MAO. By game design, the system will try to look for an ideal opponent based on the average player levels of the participating Alliance members only. If it cannot search a good match over the course of several hours, your team may be paired with a stronger or weaker rival, and some of your allies may not be able to join the fight. Please check the Alliance War FAQ for reference. Thank you also for your comment, @M_L_K_M_Rc. I think I did not know how to explain. I will give more detail, my main question is: Why, in Alliance war, does the game make us face opponents with HQ level higher than ours? Our Alliance has had difficulty obtaining victory, in the three most recent wars, our opponents have had a level of HQ higher than ours. i dont think wars are selected by hq level but more so iq levels, as mlkmrc suggested.. i am in several alliances and i see the generals also ask to put omegas away during war search as they believe omega levels also are used to determine your opponent.. Thanks @M_L_K_M_Rc and @jhonnyplumber for your comments and advice. The previous Table is an example of how they have been, the three most recent Alliance Wars we have had in our Alliance. To show the degree of difficulty we have had in the three most recent wars to defeat our opponent and get the victory. 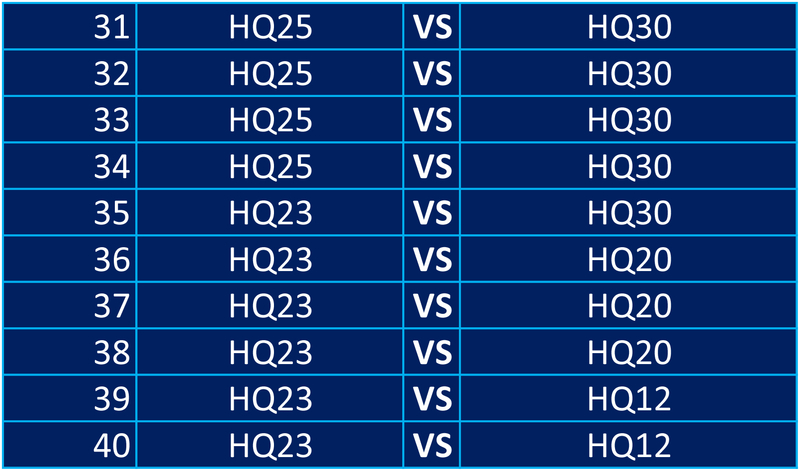 The number of bases of HQ 32 of our opponent is greater than the number of bases of HQ31 of our Alliance. Example: Our Alliance has 5 bases of HQ31 which can only attack 10 bases of HQ32 of our opponent. The number of bases of HQ 30 of our opponent is greater than the number of bases of HQ28 of our Alliance. Example: Our Alliance has 5 bases of HQ28 which can only attack 10 bases of HQ30 of our opponent. As you can see, our rival has a higher number of bases with HQ level higher than ours. Having thus a great advantage over our Alliance. For the aforementioned, is the reason for having opened this forum, to know if it is a mistake of the game in the pairing of Alliance War and if so request their soon correction and improvement. Although the current game pairing system is not based only on the level of HQ. In my opinion, if I consider, good idea, that the pairing is based on the level of HQ in all battle modes. In quick game, one of our Allies with HQ23 and 22400 medals, tells that he had to fight against rivals of HQ29. In Alliance War, our Alliance with 5 bases of HQ31 and others of lower level, has had to fight against Alliances that have more than 20 bases of HQ32. In Alliance missions, a squadron of 2 bases of HQ28 and 1 base of HQ23 was formed, they had to face an opponent that conformed a squadron with bases of HQ32, HQ29 and a base of HQ20. Ava war matching is player level not HQ level based. The fact that your opponents have 5 low level bases suggests they are probably aware of this as the low level accounts lower the overall rating of the team. If they are knowledgeable enough to do this their bases are most likely very “lean” to keep XP levels low, and I would venture to guess that your teams bases are a bit “overweight” which is why you would prefer HQ level based ratings, where you would have an advantage. My advice would be to enjoy the HQ level rated Alliance Missions instead of the XP level rated AVA Wars. It is unlikely that you will enjoy both.